The new "Passport to Explore Space" program offered by NASA Visitor Centers invites tourists to collect commemorative stamps while touring museums and visitor complexes. Earth-bound space tourists hitting the road this summer to tour NASA's historic launch pads and mission controls, as well as see the retired space shuttles on display, now have their own passport. The "Passport to Explore Space" is now being offered by the official visitor centers for NASA's nationwide facilities and the museums that display the space agency's former orbiter fleet. Guests to the 14 locations in nine states can get the passports stamped with commemorative markers representing each of the centers, earning them offers and discounts in the process. The program includes the Kennedy Space Center Visitor Complex in Florida, where space shuttle Atlantis will open on display June 29; the Smithsonian's Steven F. Udvar-Hazy Center in Virginia where space shuttle Discovery is exhibited; the California Science Center in Los Angeles where shuttle Endeavour is housed; and the Intrepid Sea, Air & Space Museum in New York City, which will reopen the pavilion showcasing the prototype orbiter Enterprise on July 10. 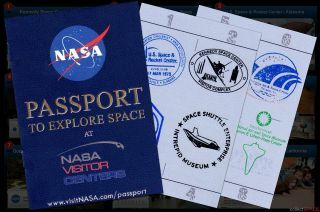 Other locations participating in the passport program include Space Center Houston, the visitor center for NASA's Johnson Space Center; the U.S. Space and Rocket Center, the Alabama home to Space Camp and the visitor center for Marshall Space Flight Center; the Great Lakes Science Center in Cleveland, which hosts Glenn Research Center's visitor center; and the INFINITY Science Center, which represents Stennis Space Center in Mississippi. Rounding out the list are the official visitor centers for Goddard Space Flight Center in Maryland; NASA's Ames Research Center, Dryden Flight Research Center and Jet Propulsion Laboratory in California; and the Wallops Flight Facility and Langley Research Center in Virginia, the latter at the Virginia Air and Space Center in Hampton. The free eight-page passport booklet can be obtained by visiting the participating locations after registering for the program online. Visitors must be at least 18 years old to join. Passport holders can receive discounts off of admission, attractions, food and souvenirs at some of the locations. For example, the Kennedy Space Center Visitor Complex offers $5 off regular price admission and 10 percent off of merchandise and its "Lunch with an Astronaut" program. Nearly four million people tour the NASA centers annually, according to VisitNASA.com. "NASA visitor centers tell the story of America's amazing spirit and exciting history of space exploration to visitors from around the world," said Roger Bornstein, the director of marketing for Space Center Houston, in a statement. "Visitors will not only be enriched, but inspired with the scores of artifacts, family entertainment and exceptional educational programs."